What can one say about Gary Numan that hasn't been said before Gary Numan's career has spanned over 20 years and has brought us some of the most interesting and unique electronic music out there. Numan's albums have always been very progressive, with few counterparts to other albums at the time. Hitting the American music scene at the time of David Bowie, Lou Reed, and Iggy Pop, Numan has always been a pioneer. 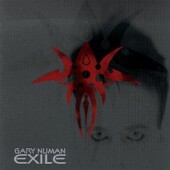 The Exile cd, released in 1997 is no exception. It is a dark and brooding introspective into the collapse of faith. The moody, soul-searching vocals blend hauntingly with the angry guitar riffs and the sadly melodic keyboards. The deeply personal lyrics hit chords within the listener, completely emersing you in a strange new world where heaven has failed and evil has become the new paradise. In my opinion, this is one of his most enigmatic cd's to date and i would highly recommend it to anyone who enjoys dark compelling music.